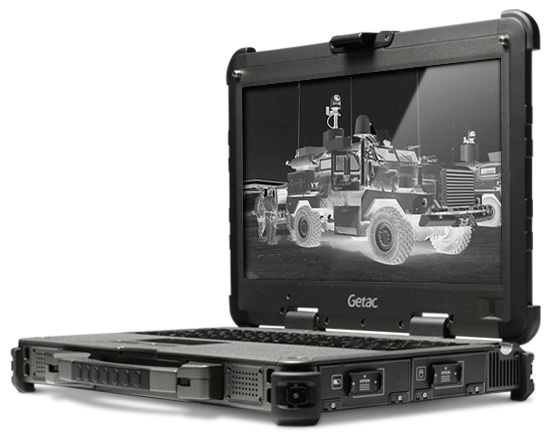 Getac X500 is the first fully equipped, commercially available notebook complying with military standards. The manufacturer brought its many years of experience with military operations into the planning and development of this extremely robust mobile device. It is designed specifically for usage in the hardest of conditions. Thanks to its outstanding interface technology, it is also ideally adaptable for executing aircraft and motor vehicle inspections. Certified with protection class IP65, it guarantees the greatest protection against moisture, salt and dust. Additionally, its casing is fungus-resistant. The high-performance Intel Core i5-4300M or i7-4600M processors, with up to 2.9 GHz (3.6 GHz with Turbo Boost Technology) deliver the best performance, together with the Intel HD graphic media controller. Optionally available is a higher performing graphics card: the NVIDIA GeForce 745M graphic controller, for demanding media usage and special military software. In direct sunlight, you can rely on the professional presentation of the 800 nits display. This 39.6 cm (15.6'') full HD display (touch screen optional) delivers pinpoint sharp pictures in widescreen format. The standard included interfaces offer gigantic possibilities, ensuring you can always rely on optimal connection options, no matter where the location. Integrated into the device are two PCMCIA (Type II), one Express Card/54, one smartcard reader and a multimedia bay for additional capacity, such as an optional second hard drive or second battery. In addition, you will find: two RS232, four USB, and two Gigabit LAN interfaces, plus VGA, HDMI, audio and microphone connections. For optimal communications on the go, you can rely on the Bluetooth and high-power dual-band Wi-Fi (with up to 700 m range). An optional webcam also allows for video conferencing. As needed, you can expand the possibilities for data transfer via GPS and mobile broadband Gobi. To round out the connection options, there is also the RF antenna pass-through for GPS, Wi-Fi and WWAN. The pre-installed Windows 7 Professional give the X500 a flexible basis for a multitude of applications. To keep sensitive data from falling into the wrong hands, the X500 security features (fingerprint reader, theft protection and positioning system) keep your data secure. Getac X500 Standard, 39.6 cm 15,6, XP, US-layout, Chip, Full HD - Notebook, fully rugged, 39.6 cm (15.6''), 1920x1080 pixels, Intel Core i7, 2.6GHz, RAM: 4 GB, HDD: 500 GB, USB (3x), RS232 (2x), Bluetooth, Ethernet (2x), Wi-Fi, audio, VGA, HDMI, PCMCIA (2x), ExpressCard 54, eSATA, PCIe (2x), keypad (US-layout, backlight), smart-card reader, brightness: 1000cd, IP65, MIL-STD 810G, Win XP Pro.